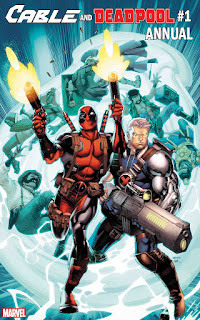 Cybertoon.com: 05.11.2018 - History’s Favorite Duo is Back in CABLE AND DEADPOOL ANNUAL #1! 05.11.2018 - History’s Favorite Duo is Back in CABLE AND DEADPOOL ANNUAL #1! New York, NY—May 11, 2018—Deadpool’s got a new job…and to get it done, he’ll need to call in help from his old pal, Cable! This summer, CABLE AND DEADPOOL ANNUAL #1 will bring the two heroes back together in a brand new story from David F. Walker and Paco Diaz, featuring a host of stellar artists who will bring readers a dose of history’s favorite duo!